If you been following us for any length of time, you probably noticed when we are on the move we try to make a stop in Pennsylvania and Ohio for some family time. We had a wonderful visit with Russ’ dad, one of his sisters and one of his brothers in the Keystone State so to the Buckeye State we went. While it had been six months since we had been to Ohio, we had a wonderful several days with my parents when they visited us in Maine. But nothing beats a trip to the place I called home for the first 18 years of my life. While we have looked at a bunch of campgrounds in area, we always end up at Delaware State Park due to its proximity to my parent’s house in Waldo, Ohio. It is a beautiful campground that is part of a large state park. The sites are all paved and well-maintained with lots of green space and plenty of trees. The only reason we have looked into other campgrounds is that the sites at Delaware State Park are electric only, so you need to either come prepared or fill your fresh tank upon arrival. It also takes a little water conservation to avoid having to leave your site to dump the tanks during the middle of the stay. The only downside to the lovely campground is the drive back to it. Once you enter the State Park you simply follow the signs to the camping area, but it is about 3 miles back to the campground which seems like forever at 20 mph. We arrived around 3 PM, drove around to pick out our site (a bonus when arriving in the middle of the week in late fall), and then took about 15 minutes to fill our fresh tank before getting backed into our site. My parent’s drove down to meet us and we headed out to dinner. We enjoyed burgers & fries and catching up on our time in Maine and our road trip thus far. Friday arrived and we had a trip planned to Lawrence Orchards. While I do enjoying picking apples, I’m definitely a fair weather fruit picker. 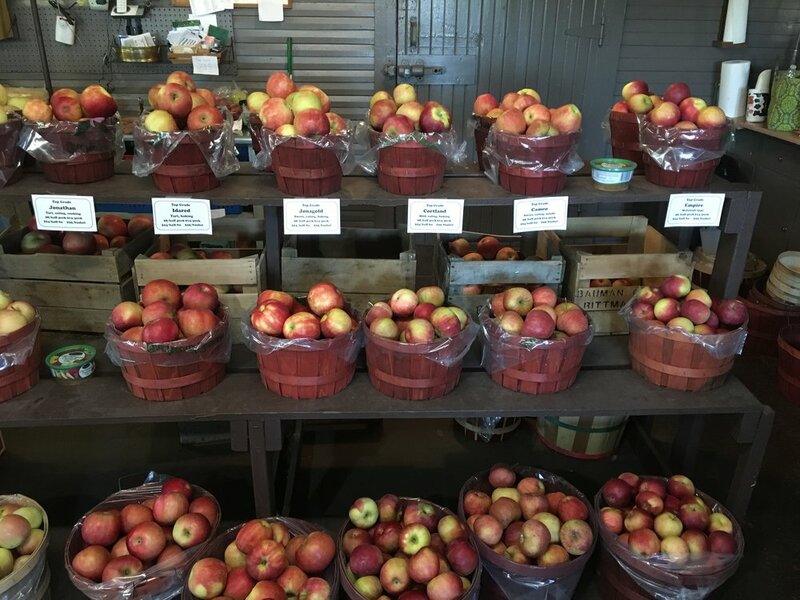 So our idea of apple picking involved walking into the Orchard store, looking at all the beautiful apples and picking our favorite! See we went apple picking, you can’t disagree with that can you? I guess if you go with that logic, I picked apple cider and my mom picked popcorn balls too. Bet you didn’t know those items grew on trees! After finishing up at the orchard, I had told my Mom about a couple places I wanted to check out in Marion. She pulled out her tour guide hat and did an excellent job leading us around the town, pointing out new places and unique spaces along the way. We enjoyed the unique items at the Crafter’s Coop (loved your display Mandie), the smell of fresh leather at Willy + Wade, and a cup o' joe from 505 Coffee. We truly enjoy small town downtowns and love cheering small businesses on along the way. Thanks Mom for showing us the town and thanks Dad for coming along even if walking in the cold is not really your thing! We enjoyed lunch together before heading back to my parent’s house to spend some time catching up with my Uncle Harry & Aunt Vick. It is always so good to see them and swap travel stories. We also got to scroll through a bunch of photos showing me what my cousins have been up to as well. Hope to see all of you guys on our next trip through Ohio. As we say time and time again that even though our full-time RV lifestyle takes us all over the place, we have still found more time to spend with friends & family than we ever did while working our “normal” jobs in Pennsylvania. For that we are thankful. We finished off our night with a movie at the Palace Theatre in Marion, Ohio. The Palace Theatre first opened its doors in 1928 and the theatre still serves the arts well. In 1976, the Palace was renovated to all its splendor with a lavish interior and stage still filled with all types of performers. The theatre is listed on the National Register of Historic Places making it a more unique venue than usual to catch a movie. The flick of choice for the evening was Battle of the Sexes, the movie based on the true story of the 1973 tennis match between Billie Jean King and Bobby Riggs. Girl Power! While Friday was chilly the sun was shining, Saturday morning was a bit different. When we peered out of the window of Charlie we saw what we consider to be poison powder or what is often called snow by others. Our home has wheels, so we always wonder why are we somewhere that there is SNOW! Just in case you weren’t sure, I love my Mom & Dad a lot and even this white poison powder can’t get in the way of my time with them. We knew that Saturday was going to be cold and damp, so we were trying to find something to do that included time together. We decided to hit up a new outlet mall for some walking, some talking, and just a bit of shopping. We had fun and spent the majority of the time searching for the fireplace one of the shop employees told us about. We did find it, but only as we were finishing up the outlet loop. Before heading home for the Ohio State vs. Penn State football game, my parents and I enjoyed some wood-fired pizza while my gluten-free husband forked a good salad. The evening was finished off with a great OSU vs. PSU football game. Go Buckeyes! RIP Beth Smith (my favorite Penn State fan), we miss you. I’m pretty sure you were pushing Saquon Barkley all the way down the field on that first kickoff return. Sunday morning was spent at the church I grew up in and the place Russ & I got married. It was great to see so many smiling faces and catching up with people I hadn’t seen in ages. We headed to my parent’s house for lunch and enjoyed a tasty sampling of soups with choices ranging from Chili to Ham & Bean to Vegetable and a salad with personalized salad dressing! Seriously everyone got to pick their own flavor of balsamic and their own oil. We had some pretty tasty combinations such as Lemon Garlic, Blueberry Olive, and Peach Pecan. We finished off the evening with a campfire. My mom had requested a campfire and I quickly demanded s’mores. Wanting to sneak in a visit with one of my childhood friends, we invited Shannon over for the festivities. 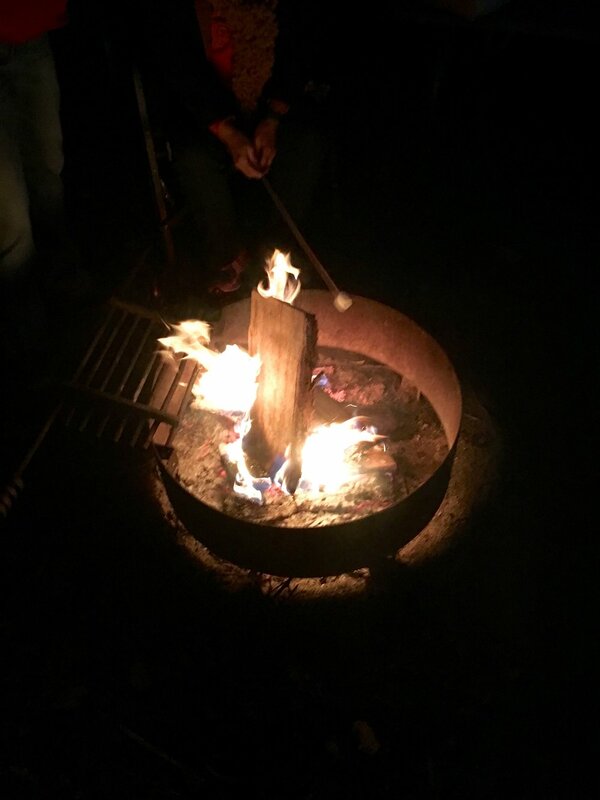 When we planned to have the fire the weather was what I would consider perfect campfire weather (chilly, but mild). 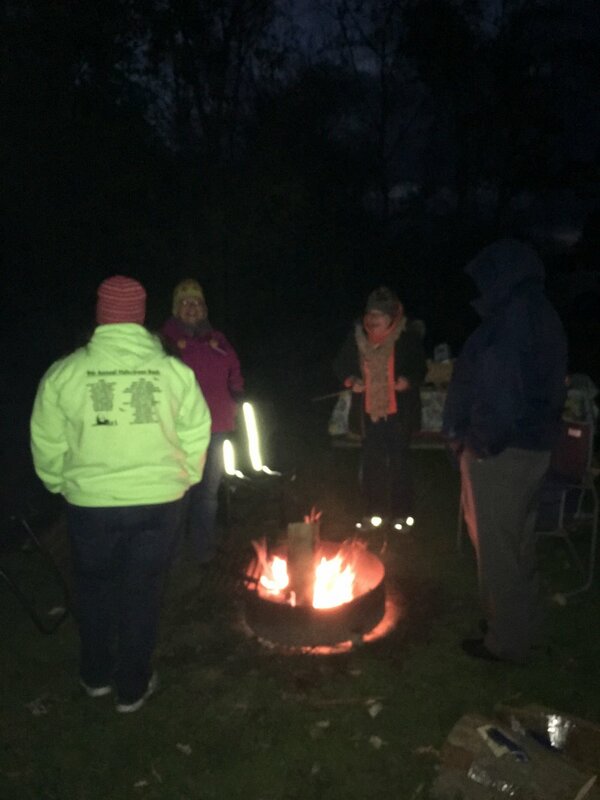 Unfortunately, Mother Nature must have a different set of requirements for her idea of perfect campfire weather which was down right frigid. We grilled steaks and joked about the fact that we had never eaten with gloves on before, which my mom was smart enough to be wearing. It was cold, but the conversation was what kept us warm. Cliche, but true. Shannon it was so good to see you can catch up. Thanks for coming for a visit and freezing you buns off with us - it is always SO GOOD to see you. Mom & Dad - as always, thanks for making our visit so special. Dad, I promise we will schedule the weather to be a bit warmer for our next campfire and Mom, cold or not we can still eat S'mores!